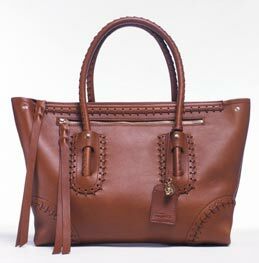 Alexander McQueen have just launched their new tote bag that promises to be one of the statement items of the Spring Summer 2011 collection, no doubt cropping up on chic shopping streets in all the right locations. Sarah Burton’s design leans heavily towards traditional craftsmanship, underscoring the folk feel to the season’s collection. Available in black, tan, ivory, red and navy leather, the aptly named ‘Folk Tote’ is manufactured in Italy by veteran artisans that realise the design combining practical urban elegance with deft decorative touches drawing on European folk traditions. For those who needs something a little more dressy, the stunning range of evening clutch bags are perfect for the woman who wants to remain elegant and glamourous but is playful enough to enjoy a little gallows humour. The understated threat of an elaborate knuckleduster topped with a frothy Mohawk of cherry blossom in gold is the perfect example of the contradictory elements that have always made up the McQueen magic. With two similar designs, one in black satin, the other in mint python, these clutch bags are dripping with a luxurious irony, a bold statement that high fashion need not be boring or take itself too seriously. Other models in the current collection tread a similar path with their elegant Vanitas death’s-head clasps atop sumptuous python or embroidery with a Samurai slant.